If you are like me then you are NOT getting ENOUGH of Star Wars. There is never enough Star Wars. I crave Star Wars info, I want to know everything about Star Wars and forget everything about everything else. Annnnyyyyyway, since the previous extended universe is no longer canon and The Force Awakens was pretty. damn. good, I decided it was time to read all of the books that fall under the Journey to the Force Awakens category. I wasn’t sure where to start but I started with this one because it was like $11 on Amazon or something like that. 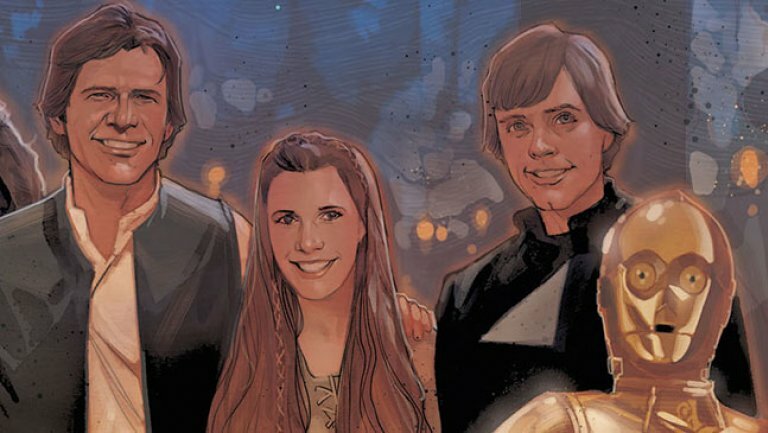 The squad we all know and love is on the cover of Shattered Empire, but despite the familiar characters on the cover, this book is mostly about Po Dameron’s parents (familiar characters do show up a lot, but the story focuses on Po’s mama, Shara) You’re probably like “wtf would I want to know about Po’s parents” but trust meeeeee, they were pretty big in the rebellion during/after the Battle of Endor so they are Interesting People, and it’s pretty cool to know that being a cool pilot is in Po’s blood. Hope that wasn’t too much of a spoiler for this book? ?? More spoilers below this. Shara Bey and her husband Kes Dameron are Po Dameron’s parents, and they are cute, in love and also strong and important. They don’t get to see each other very often do to being on separate missions and Po stays with Shara’s father. The book covers a couple of the big missions they were on and ends when they are done and settling down in a new home. The art in Shattered Empire is some of the best comic art I’ve seen, usually I’m reeeealllly picky about action scenes in comics looking terrible or there being too many lines (ugh, sorry, I’m a snob). This was REALLY beautiful though. The coloring and facial expressions were On. Point. Especially Princess Leia, she looked GORGEOUS. I’m really, really passionate about Naboo politics and I love that one the bigger characters in this is a Naboo Queen – Queen Sosha Soruna. Queen Soruna is pretty badass tbh. I don’t think this was too spoily. Nah. Not too spoily. But I definitely thought it was good – loved the new characters, the scenery/art, the old characters were accurate too according to their looks/dialogue and it was overall a Good Read and very informative about just what went down right after the Battle of Endor. Reeeeead it.